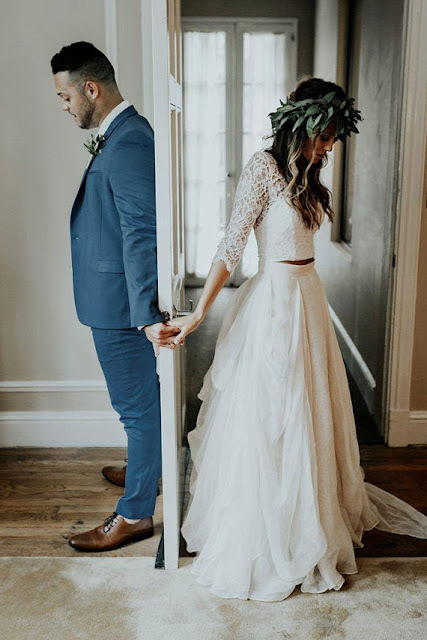 If you are looking to break tradition and go for something different, a two piece wedding dress might be the perfect choice for you. However when people think of a two piece wedding dress they automatically think of a exposed tummy and a tight crop top , but bridal seperates can still look classic, elegant and modern. 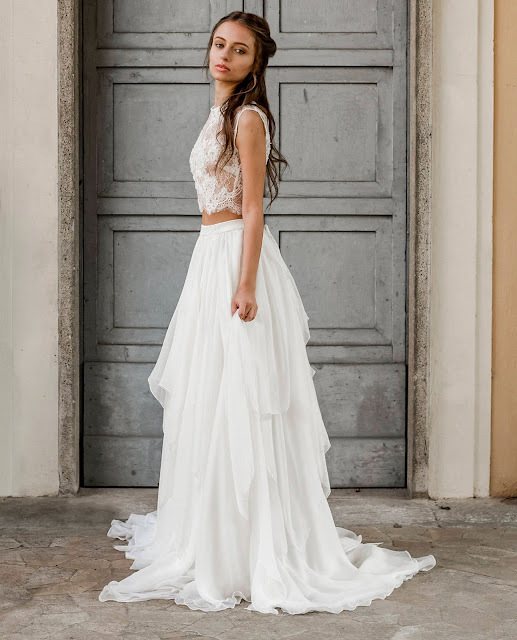 Elegant, whimsical and boho, ,whatever your bridal style these little tips will help put together your own two piece wedding dresses that are not just crop tops. When choosing your two piece wedding dress, don't be scared to mix and match. You'll be surpised at how different textures and fabrics flow together. 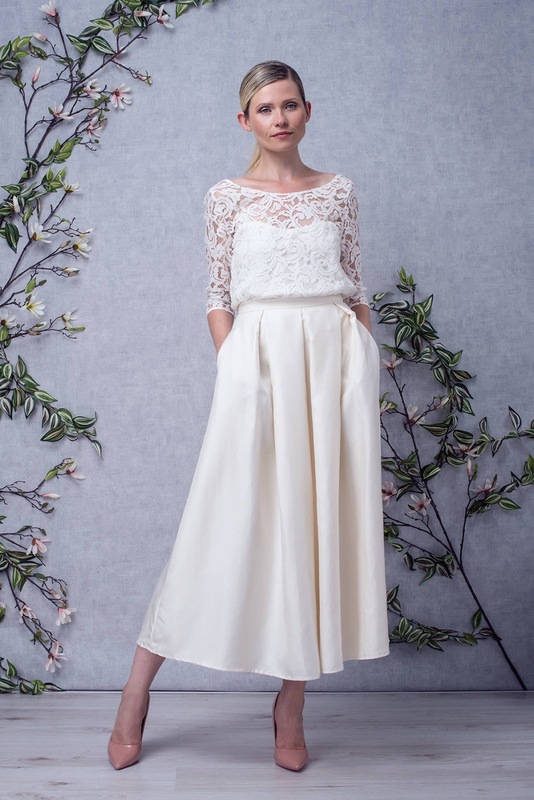 This lovely Boho lace top and chiffon skirt is from MotilBespoke bridal. This ivory color lace top is a combination of fine lace, cool fringe, and shiny beads. It is very flattering, feminine and a definite eye catcher. The lace top has a unique open back and lace sleeves, it is light, airy and is perfect for a beach wedding or an outdoor occasion. This ivory lace crop top and silk chiffon skirt ensemble from ElaSiromascenko is another lovely example of this. Pick seperates with striking elements. For those who are shorter and more petite in stature going for a top that stands out is perfect. This top from White Meadow Bridal has a fully lined stretch silk bodice and a kimono sleeve hand stitched all over with countless pearls, this stunning top is so much fun to wear on the day and long after your wedding day. A sleek skirt or a top can still have a classic timeless look. Love this one from MilaBridal. The clean lines of the skirt make it stunning. Longer sleeves and long sleeves are not just trendy at the moment but super elegant too. Take a look at this Bridal top with 3/4 sleeves from YaBaasitu. Perfect for beach wedding and outdoor weddings. Shorter skirts add a contemprory touch, they are comfortable and perfect for the modern bride. This Lace top and high waist skirt are from the french store FaithCauvain and can be found on Etsy. 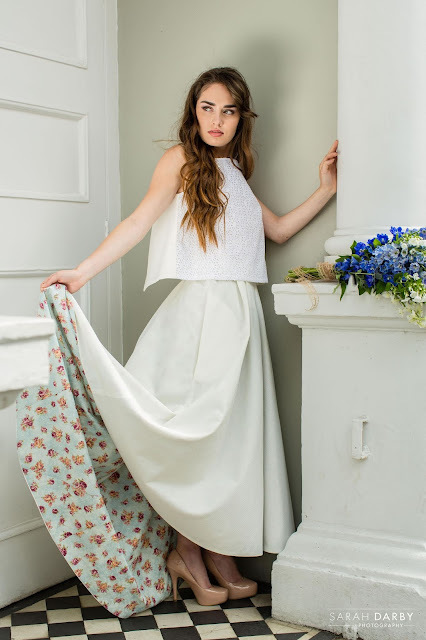 This ensemble from MaudiKa Bridal is really perfect for a countryside wedding, or a beach wedding, the crop top is made of a lining of cotton, with a layer of broderie anglaise and small beads hand stitched all over. I love this unique touch, the original tea-length skirt, is provided with a short train. The lining is made of two different floral fabrics, with a blue background. Traditional with a touch of modern, lace on lace bridal seperates that look seemless when put together but are actually two pieces. 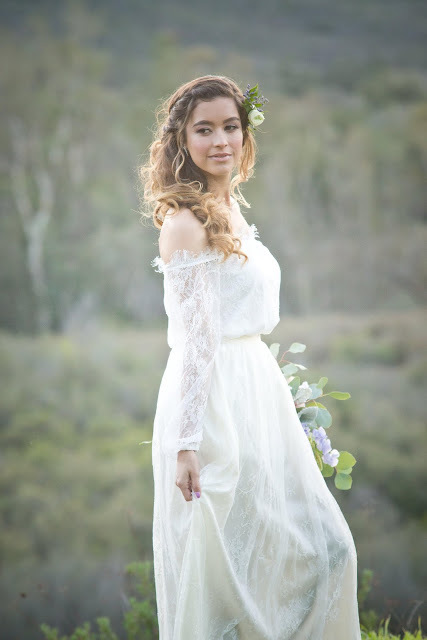 This chantilly lace long sleeve top and skirt from Iselle Bridal Studio is perfect for the Boho Bride. Two pieces don't need to be a top and a bottom it can even mean two pieces layered to gether. 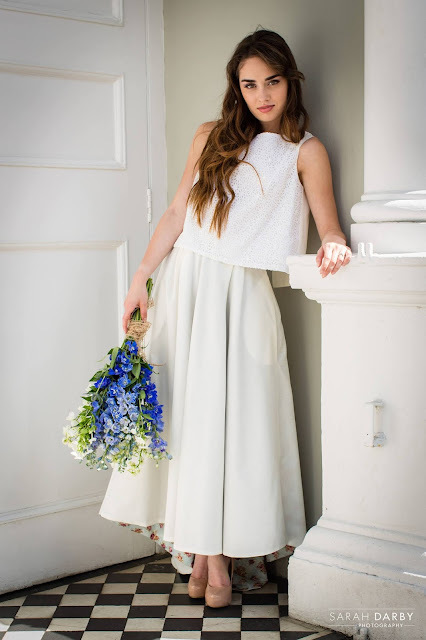 This beautiful Chiffon-Lycra wedding dress by Blush Fashion comes with a lining separate. A magnificent classic dress, with feminine modern cut. 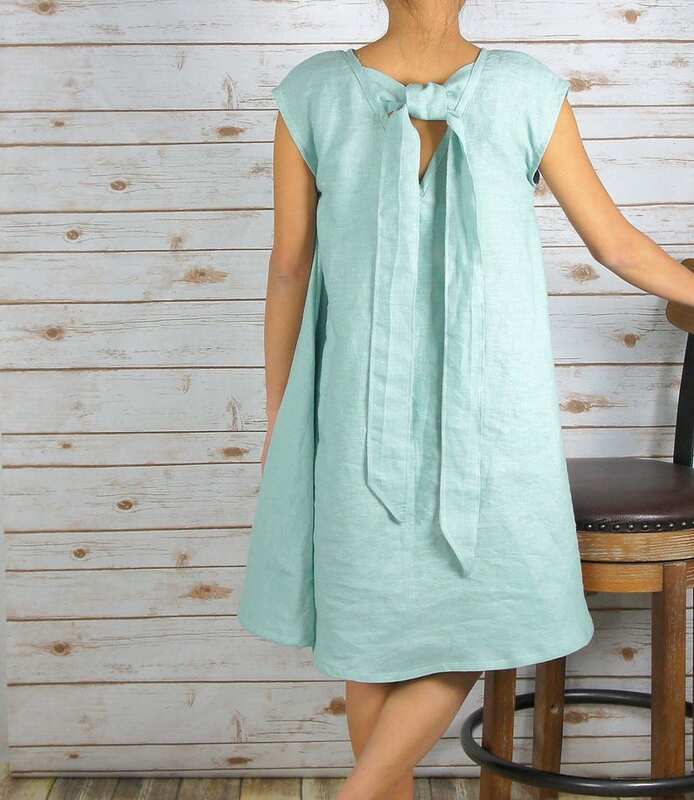 It has a long slit, from waist down, that create a very feminine and sophisticated figure and a wide fabric sash to tie around the waist.It is perfect and very flattering for Plus size women. 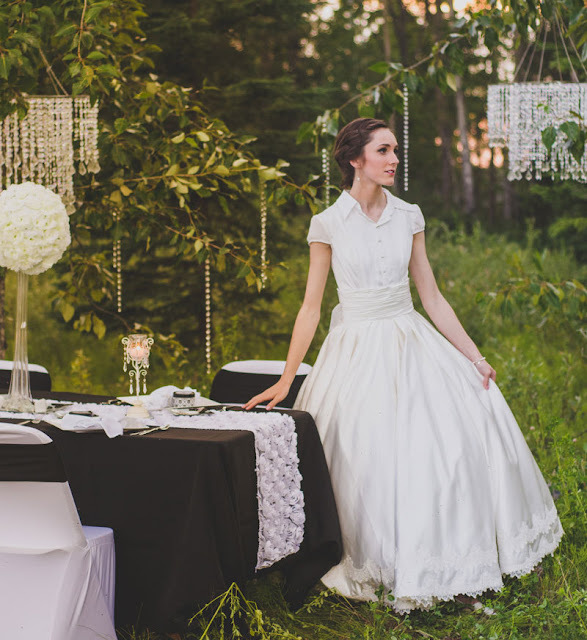 Go for a totally unique look with this gorgeous ball gown style 2 piece wedding dress with a blouse top and satin ball gown skirt with lace hemline from ieie Bridal, it is perfect for the vintage bride.